From the time perspective, research by members of our lab can be conventionally divided between three periods. 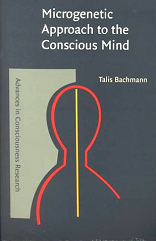 First (I), psychophysical and cognitive studies carried out by Talis Bachmann between 1975 and 1992 in the labs of Department of Psychology, University of Tartu, Department of Psychology, Vanderbilt University, and in the Moscow University. Second (II), years 1993-2006 when the core of the group was forming, aided by support from Tallinn University, grants from Estonian Science Foundation, targeted financing from Scientific Competency Council, and Estonian Center for Behavioral and Health Sciences. Third (III), on from 2007 new rooms and new equipment made it possible to supplement the primarily behavioral research based on psychophysical computer-aided visual perception and attention experiments with empirical cognitive neuroscience research based on modern equipment of neuronavigation and EEG/TMS. From the first period, when Talis was more or less a “lone player” occasionally collaborating with different colleagues and students, the following main results of research were gathered. In mutual masking of successive objects, it was shown that (a) B-type U-shaped masking function can be found also for spatially overlapping target and mask, (b) attentional search for a pre-specified target eliminates U-shaped masking, (c) the robust advantage of the second object over the first one with intermediate stimulus onset asynchronies (SOAs) can be best explained by replacement (nowadays one would say “substitution”) of the first stimulus (S1) by the second stimulus (S2) because of attentional switch from S1 to S2 (Bachmann & Allik, 1976). Further on, a theory of masking was introduced where the typical metacontrast and backward masking effects were explained for the first time as a result of interaction between specific (pre-conscious) mechanisms of encoding stimulus features and the “non-specific” reticulo-thalamic mechanisms of facilitatory modulation of the neurons of the cortical specific system (Bachmann, 1984). Also, the 1984 paper suggested conscious awareness of perceptual contents as a result of special psychological operation (“perceptual retouch”) that should be a special topic of study. Therefore, the 1984 paper can be considered as one of the first explicitly dealing with issues nowadays called neural correlates of consciousness (NCC) and essentially suggesting that concepts of perception and attention are not sufficient for understanding explicit cognitive phenomena. By the way, the original version of the manuscript of the 1984 paper was initially broader where besides masking other phenomena like spatial-attentional pre-cueing, binocular rivalry etc were explained based on the retouch model. The paper was submitted to Psychological Review in 1982, but rejected with suggestion to send it to a more specialized journal, which ended up in a publication in Perception &amp; Psychophysics, but with other phenomena besides masking thrown out of the accepted manuscript. It was only in later publications (e.g., Bachmann, 1997, 1999) where perceptual retouch theory as a meta-theory explaining many phenomena was introduced in English language international publications. 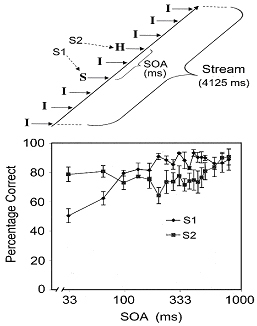 This theory allowed intriguing experimentally testable and positively tested perceptual effects such as subjective contrast enhancement of S2 by S1 (Bachmann, 1988), speeding up S2 perception by S1 as measured by temporal order judgment (TOJ) (Bachmann, 1989), flash-lag effect with spatially superimposed stimuli where in-stream targets are facilitated compared to out-stream targets (Bachmann &amp; Põder, 2001), unusual dominance of S1 over S2 in mutual masking when non-specific thalamus was artificially stimulated by implanted electrodes (Bachmann, 1994). The monograph on visual masking and the perceptual retouch theory (Bachmann, 1994) has become one of the better-cited publications of the group members. Colleagues interested in the earlier version of the retouch theory, in how to approach perception problems from the point of view of non-specific thalamic processes as the mechanism for perceptual consciousness and also in the overview of masking research in general can use this book, we hope, even nowadays. Other research results from that period were quite varied, but one topic stands apart as another one known quite well internationally besides our masking studies and having possibly more direct practical implications. An example of a spatially quantized image is shown below. It is important to know how perceptual system processes different spatial scales of images not only because of theoretical interest but also because in applied/practical circumstances images can be degraded and we need to know limits of perception of the degraded images (e.g., faces on surveillance cameras or objects in images taken from satellites) and possible means of overcoming these limits. Research on spatially quantized (pixelated) images produced some interesting results. For the first time the effects of systematic change of pixilation coarseness on image identification were examined. A paradox of duration of presentation means that when coarse quantized images are presented, after initial increase of object identification with increase in exposure duration a stage follows where further increase in duration leads to decrease in identification (Bachmann, 1987, 1991). Apparently, in the microgenesis of visual perceptual image coarse scale representation is built up sooner than fine-scale representation and as with coarse-scale pixelation the fine scales represent non-veridical, misleading local cues (sharp straight edges and orthogonal corners of the pixels), longer presentation times increase masking: local fine-scale cues become dominant over coarse-scale configural cues. It was also found that identification of pixelated facial images drops abruptly when coarseness of pixilation drops below about 11-15 pixels/face (measured horizontally). Subsequently, the coarse-to-fine microgenetic regularity was supported in experiments where spatial local pre-cue was presented before quantized visual-search targets (Bachmann & Kahusk, 1997). Pre-cueing paradoxically (contrary to the standard results from spatial-attentional pre-cueing) decreased target identification. Pre-cue must have started the microgenetic coarse-to-fine process ahead in time and at the moment of target arrival perceptual filters must have been tuned already more to local detailed levels (which in case of coarse-quantized images carried misleading, masking cues). Research carried out approximately between 1993 and 2006 continued to be varied. Talis was more coherently supported by students and co-workers. 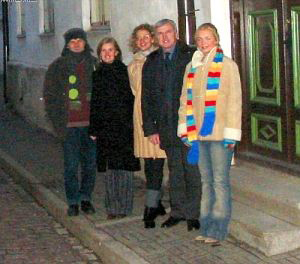 (The picture here is taken from the end of this period, where the lab members are seen in front of a peculiar house at the Dome hill of Tallinn — the birthplace and first home of Wolfgang Köhler who was the founder of Gestalt psychology and whose father was employed as the Director of the school. Köhler family moved to mainland Germany when Wolfgang was a child). Part of the members of our lab from that time, from left to right: Endel Põder, Iiris Luiga, Karita Hommuk, head of the group, Pilleriin Sikka. (Pilleriin continued her studies in Oxford University and later joined Antti Revonsuo’s labs in Turku and Skövde.) From 1993 until 2006 our group used lab space in Tallinn University. The research agenda of the group evolved mostly around the topics of perceptual microgenesis of visual images, general microgenetic theorizing, spatial selective attention, visual crowding, masking, flash-lag effect, conscious perception of the objects presented in streams of objects (including studies of attentional blink and integration of object features into objects). A systematic account of the problem of microgenesis in the context of consciousness studies appeared not so long ago (Bachmann, 2000). The affinities in theory and approach with what Francis Crick and Christof Koch stick to (e.g., 2003, 2005) can be noticed in that book. Yet, the no less important “products” of our lab are the peer reviewed journal articles. What were they telling us from that period? Flash-lag is an illusory phenomenon of perception that emerges when observers compare a continuously changing object (e.g., continuous change of colour of a static object or object in motion continuously changing its position) with its replica that is very briefly flashed alongside the changing one: the flashed object appears to lag behind the changing object in feature space despite that they had actually identical feature values at the moment of flash. Bachmann and Põder (2001) showed that flash-lag appears also when the stream that forms the continuous stimulation within which the target-object is presented does not change in feature space. Streamness per se appears to be what matters. Later on a retouch theory based explanation for all phenomena in the family of flash-lag effects was introduced, perceptual acceleration typical to the stimuli within the initial epoch of stream was substantiated, mutual masking between in-stream objects was analyzed and the conditions where backward masking becomes attentional blink were introduced (Bachmann, Luiga, Põder & Kalev, 2003; Bachmann & Sikka, 2005; Bachmann & Hommuk, 2005; Hommuk, Bachmann & Oja, 2007). It is noteworthy that attentional blink is obtained also with RSVP-streams of invariant objects, the initial epoch of a stream of objects has some exceptional properties compared to later stream epochs (when masking and perceptual latency are what concern us) and that individuation of an object as a distinct token in stream plays an important role in predicting whether there will be strong masking between in-stream objects or not. Main results of Bachmann & Hommuk (2005) When perception of visual images (including faces) is studied, there are several key issues at hand: the relative roles of spatial frequency of contrast, local features, and wholistic configuration of features should be understood. Using spatially quantised images of perceptual objects proves to be a good method for this (Harmon & Julesz, 1973, see also the illustration shown before). Continuing the earlier research on perception of quantized images (Bachmann, 1987, 1991), some new effects were found (e.g., Bachmann & Kahusk, 1997, on the paradoxical effect of identification impairment with precueing quantized images; e.g., Bachmann & Leigh-Pemberton, 2002, on the effects of quantization on binocular rivalry of facial images interpreted as covert processes of search for a pre-categorical Gestalt). In one of the studies we used quantised images as forward masks to non-quantised target images (Bachmann, Luiga & Põder, 2004). The source images for masks were a quasi-random spatial noise spectrally close to face images, a face image identical to the target-face image, and a face image different from the target image. We found that the pattern of variation in the level of correct identification of the target images supports better the Gestalt-like configuration processing model of face identification than the generalized spatial-frequency analysis model or local feature processing model. It appeared that a coarse-quantised mask derived from a face that was different from the target face did not interfere with target perception at its initial microgenetic stage. This refers to the possibility that a generally compatible, but local feature wise different, image, can act as a surrogate perceptual data for the subsequent microgenesis of another, following image. The microgenetic processing model where the initial stages perform coarse generalized analysis of data is well compatible with this. Because of this property of the processing sequence, the microgenesis of the later appearing object can be run on an earlier, spatially overlapping object. When we used quantized masks as backward masks, we found again that the configuration characteristics are crucial in predicting the level of expression of masking; it was also noticed that because masking was decreasing with increase in masker pixel size, the substitution theory of masking in the version that was introduced by Vincent Di Lollo, James Enns and their associates was not well compatible with the results (Bachmann, Luiga & Põder, 2005b). Surprising results of the study where the ratings of the attractiveness of the face were gathered revealed that attractiveness is perceived already when the face image is very coarsely pixelized (Bachmann, 2007a). In the work in collaboration with British colleagues it appeared that using a coarse quantised version of the dynamic video-image of a speaker face did not eliminate the McGurk effect (McGurk & MacDonald, 1974) – the illusory auditory perception of a phoneme was present when a viseme incompatible with the phoneme was experimentally associated with it even when depicted at a coarse quantized level (MacDonald, Andersen & Bachmann, 2000). Inter-modal effects can tolerate a very coarse-scale depiction of visual information. For example, the image of a mouth in a quantized speaking model still capable of inducing the McGurk and MacDonald effect consisted in only 2 by 3 pixels. Finding out what are the perceptual features that permit efficient search of target objects displayed among the set of competing distractor objects is one of the central issues in attention research. Related to this, comparison of processing models that fit or do not fit with empirical data about attentional selection is an important task. It turns out that relative position of the target-image element makes it easy to find the target among distractors, provided that the change in the relative position of this element allows to define the target-object as belonging to a different class of objects compared to distractors (Põder, 1999). The remarkable aspect of this study was that in terms of the absolute spatial distance between the elements within object (comparatively for the two classes of objects specified either by simple feature difference or by relative position difference) there should be a better sensory discriminability for those target stimuli that actually were more difficult to search. By using the same type of stimuli, the effects of central and peripheral (spatially local) processing limits were also investigated. The influence of local limits (lateral masking) was roughly equal for the two types of objects, but the effect of central processing limits was qualitatively different (Põder, 2004). With simple feature search, the results fitted the unlimited capacity model. With search according to relative position of the element, carried out within the same class of objects the constant limited capacity model was better. Contrary to what was found in the earlier research, when observers searched for the target object that was specified according to its size, it was possible to effectively select the target presented within the stream of RSVP objects (Põder, 2001). Researching relations between attention and masking is an important topic — if not for anything else then at least for exploring the differences and commonalities of the attention and awareness mechanisms. Experiments showed that in order to discriminate simple spatially oriented targets that were presented on the background of the higher-contrast masking gratings, the involvement of the limited capacity attention mechanism is necessary. Simple detection of the same targets on the same background or target orientation discrimination without spatial masks was possible without processing capacity limitations (pre-attentively). The additional experiments where spatial overlapping of a target and a mask was varied showed that the effect should originate primarily from the influence of attention on lateral masking (Põder, 2005). It also appears that the interfering effect of local lateral masking can be overcome when target is marked among the distractor objects by a localized colour feature that itself does not belong to the target object (Põder, 2006). Local lateral spatial interaction has a substantial effect on crowded target masking only when the temporal interval between target and mask is short; with intermediate and longer time intervals (about 100 ms and up) the subsitution masking between integrated objects becomes decisive (Bachmann, Luiga & Põder, 2005a). In a follow-up research conducted in 2006 we found that in substitution masking conditions effective attention can be engaged in a bottom-up manner by spatially localized sensory input but may not be engaged in the top-down manner of centrally controlled attention (Luiga & Bachmann, 2007). These empirical results support the need of a critical analysis and further development of the substitution-masking theory of James Enns in that it should be more precisely specified and implemented in modeling what kinds of attentional focusing do participate in substitution masking and what kinds do not. (See also Bachmann, 2001, 2005, on the critical discussion of substitution-masking effects and theories.) In the meantime, during that period Iiris spent some time in the Herzog lab in Lausanne trying to test whether shine-through effect (Herzog, Fahle & Koch, 2001) would hold with more complex, half-tone, ecologically valid stimuli. Unfortunately the hypothesis did not receive support and the results were never published. Endel also spent some time abroad visiting Greg Francis’ lab in Purdue. It is possible to overcome local lateral interference by changing a target stimulus or it’s local background or increasing the crowdedness of the objects so that the target would be better discriminated from the neighboring stimuli. (Põder, 2006, 2007). The research done on crowding-effect by Endel Põder in our lab and also in Leuven in collaboration with Johan Wagemans (Põder & Wagemans, 2007) show the relations of this effect to the sensory mechanisms of attention and support the attention theories based on input selection. During that period of lab activities we also described the illusion of temporal order reversal (Bachmann, Põder & Luiga, 2004): when two spatially overlapping objects are presented with very short onset asynchronies and when the first object has a clearly higher contrast, the order of presentation appears to be reverse to what it was actually. The well known perceptual theories and sensory phenomena cannot help explain this illusion. It seems to be a higher-level bias effect where the typical differences in the cognitive clarity of successive objects evaluated retrospectively are spontaneously attributed to the fast sensory presentation conditions where the real temporal discrimination is impossible. Besides psychophysical research on masking, attention, temporal order perception and crowding, we also begun to explore person perception effects. Evaluation of personality characteristics at zero acquaintance which is based on perception of the person appearance is a topic where cognitive psychology, personality psychology and forensic psychology meet. It is both practically important and theoretically intriguing to make sure whether correct perceptual inference of personality traits can be made according to expressive and morphological phenotypal features. Usually it has been found that valid evaluation of the real characteristics such as criminality or trustworthyness cannot be done, but there are socially shared stereotypes in interpreting facial or bodily cues as indices of personality traits or behavioural dispositions (interpersonal affordances). Most often the cue overgeneralization effects cause inter-rater consistency despite the lack of validity of face based evaluation of true personality traits. Recently we found that observers perceived people as being more suggestible when their faces belonged to the set that was earlier perceived as more babyfaced or merry by another group of observers (Bachmann & Nurmoja, 2006). The correlation between real behavioural suggestibility and perceived suggestibility was absent. Currently we examine the relative share of the stable morphological and expressive cues in trait perception and extend this research beyond suggestibility and trustworthyness to include other trait dimensions as well. 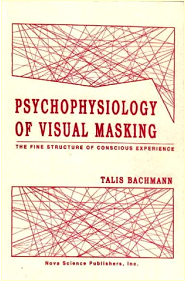 Among the handful of the internationally known theories of masking we find also the perceptual retouch (pertentional) theory by Bachmann (Bachmann, 1984, 1994). Beginning with 2007, the current period of our lab activities begun. Since 2007 we are working in the rooms of the Faculty of Law of the University of Tartu, Teatri väljak 3, Tallinn. With the help of EU, Enterprise Estonia, Finnish specialists and colleagues (Nexstim Ltd, Algol Pharma), and with support from ECBHS a modern, 5 million EEK worth, equipment was installed. This facility makes it possible to do standard EEG/ERP research, TMS studies, MRI based high-precision neuronavigation of TMS and combined TMS plus EEG/ERP investigations. This new development has enriched our research capabilities and options considerably. But the traditional psychophysical experiments continue as well. Quite naturally, masking studies as one of the core research traditions have continued. In metacontrast, different speeds of microgenesis were found for target internal contours and target surface brightness in experiments showing that higher level visual-cognitive factors do not influence metacontrast (Bachmann, 2009a). When the criteria for evaluation of the metacontrast masked targets vary, the masking function over the same range of SOAs can show opposite dynamics depending on these evaluation tasks. Edge/local contour systems and area filling-in systems have different temporal scales of action. There are no universal rules or types of masking generalisable over different stimuli attributes and subject’s tasks. Attentional selection mechanisms in object substitution masking (OSM) are also influenced by the contrast polarity of the target and mask configuration. OSM is attenuated when the target and the mask have opposite contrast polarities (Luiga & Bachmann, 2008). Higher level factors such as presence of globally grouped distracters that remain in view after target offset also influence OSM. Even if local sparse masks typically surrounding targets in OSM are absent, spatially far distracters forming a global object can act as substitution masks (Luiga, Gellatly & Bachmann, 2010). On the other hand, congruency between the shape of local targets and the shape of the spatial arrangement of global masks did not have any facilitating or interfering effects. (Navon’s global-on-local interference effects were not instrumental or present in OSM.) In the seminal mutual-masking paper by Bachmann and Allik (1976) substitution of S1 by S2 as an attentional-masking effect was demonstrated. Yet, it was not possible to specify whether S2 substituted S1 at the stage of integrated objects (each object with all features pertaining to that object internally bound together) or whether substitution meant misbinding of S2 features with S1. In Hommuk and Bachmann (2009) we showed that temporal limitations arising from rapid successive presentation of S1 and S2 caused limitations in feature binding. Selectively attending to one feature of a masked object did not facilitate reporting the other, initially unattended feature of that object. It was also shown that different types of feature attributes of the objects in masking show quantitatively different dynamics of misbinding. Masking is nothing but preventing target from becoming consciously experienced or changing contents of consciousness in terms of distorting or suppressing the perceptual qualities of targets. Therefore, masking is a good tool to study psychophysical regularities of conscious perception and when combined with brain imaging – also NCC. 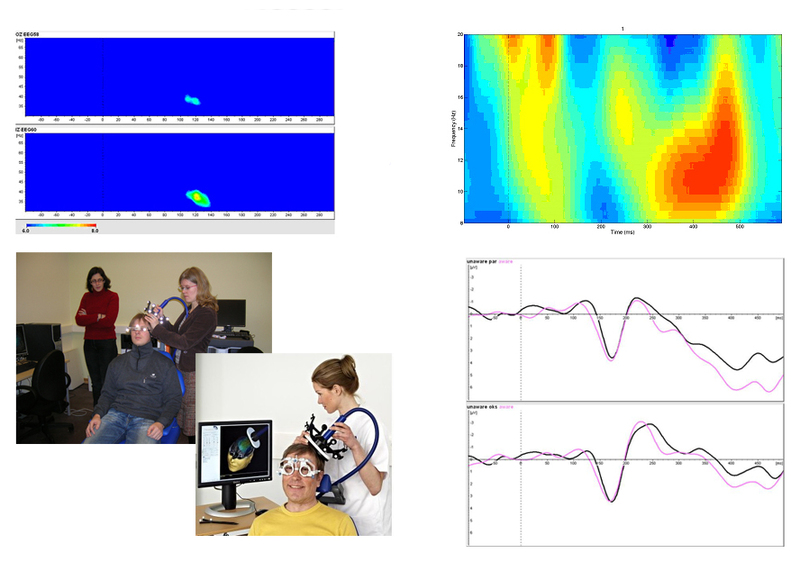 Extending the initial tradition of this lab to use masking as an instrument for consciousness studies (Bachmann, 1984, 1994, 2000), we began to use EEG and TMS for this purpose. 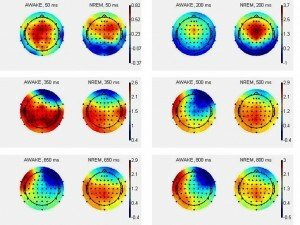 Thus, in one paper it was shown that in the metacontrast-masking conditions where stimulation parameters were kept invariant, the trials with target awareness were associated with less expressed gamma band oscillatory activity (measured from occipital electrodes) and the trials with lack of target awareness were associated with stronger expressed gamma band oscillations (Aru & Bachmann, 2009a). This seemingly paradoxical result can be explained by the perceptual retouch theory because the enhanced boost of gamma activity coincided in time with presentation of mask. The boost of gamma activity set in motion by target presentation (and hypothetically mediated by the non-specific modulatory systems) becomes maximized in cortex right when mask signals arrive about 70-100 ms later or are about to arrive there after this delay. As a result, mask becomes consciously well experienced and target signals remain at the unconscious level of perception. In the trials where this boost happens to be weak or otherwise inefficient, mask does not substitute target in awareness and target is well discriminated. However, when target and mask were presented almost simultaneously in the shine-through paradigm of Michael Herzog (as it was done in another study – Aru & Bachmann, 2009b), target-aware trials were associated with a bi-focal boost of gamma activity that begun already before target-and-mask presentation and continued thereafter for about 100 ms. (Both low gamma band and high gamma band oscillations were involved.) In this experimental condition gamma-activity must have helped better discriminate target in the context of closely neighbouring mask signals. Moreover, as already pre-target gamma-boosts predicted good target awareness, the theory of masking involving non-specific modulatory processes can be valid. (Non-specific meaning also thalamic subcortico-cortical efferents modulating the gain of cortical specific neurons and/or synchrony between the neurons carrying signals of stimulus features.) It is therefore natural that the latest developments of the retouch theory in our lab are connecting it with the processes accessible to brain imaging, specifically in the domain of gamma frequency neural oscillations in the brain (Aru & Bachmann, 2009; Bachmann, 2006c, 2007b). Particularly, and in line with views expressed by Llinás, Ribary, John, Steriade, Bogen and some others, it is hypothesized that conscious perception requires coordination between two oscillatory processes – oscillatory activity supported by the afferent pathways projecting through the primary specific pathways onto cortical pyramidal neurons and signaling specific features of the stimuli; oscillatory activity originating from interactive networks of the “non-specific” thalamus and cortex (possibly thalamo-cortical projections onto apical dendrites of the pyramidal cells). When the first of these subsystems produces synchronous oscillations between the neurons representing different stimulus features, it helps create specific stimulus representation with feature-binding. However this active system is insufficient for conscious experience of these feature-wise bound objects. This binding-operation should be synchronized also by the non-specific subsystem’s oscillatory activity in order to allow the perceptual contents of the first subsystem to become consciously experienced. Thus, it is a kind of binding of binding (Bachmann, 2007b) – ongoing interaction with another ongoing interaction. Masking can be therefore conceptualized as binding S2 related specific oscillatory activity with the boost of non-specific oscillatory activity evoked by S1, which leads to conscious-level perception of S2 features instead of S1 features. Because brain processes, and particularly the long-range connectivity related ones, are highly task- and state-dependent, it should be important to study the properties and dynamic regularities of brain activity in the conditions where states are manipulated in a task-free manner and processes are evoked as free as possible from the use of some environmental meaningful stimulation potentially capable of bringing about variations in individual psychological interpretations and states. 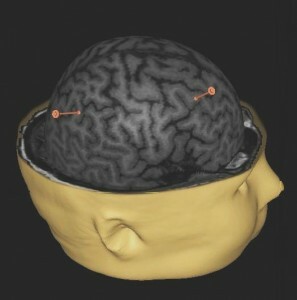 Use of TMS is one means to stimulate brain directly and without having to present meaningful environmental stimuli. We have carried out several recent studies using TMS. For example, we showed stability of the size and contrast of TMS-evoked scotomas over many successive trials of single-pulse occipital stimulation (Murd, Kreegipuu, Luiga, and Bachmann, 2010). As the earlier study by Kamitani and Shimojo did not use neuronavigation with high spatial precision, we replicated their findings with a more reliable spatial consistency between successive stimulations. We also observed enhancement of attentional effects on in-stream perception after repetitive transcranial magnetic stimulation (rTMS) (Hommuk et al., 2007). When in addition to a task-free occipital TMS the task-free state of the subjects was manipulated with caffeine (vs placebo control), cortical ERPs showed no decrease of peak latency under caffeine (a stimulant of arousal), but the N1 amplitude and slow negativity were enhanced, particularly as measured from frontal electrodes (Murd, Aru, Hiio, Luiga, & Bachmann, 2010). There were no laterality effects (contralateral and ipsilateral TMS compared). These results allow purposeful task-free manipulation of cortical states related to non-specific systems in future studies with standard psychophysical experiments (masking, search, attentional blink etc). We also investigate task-free TMS effects by comparing brain responses (ERP, induced oscillatory activity) in wakefulness and in non-REM sleep (Mihkel Stamm as the principal experimentator). The results of this unfinished project will be compared to the results obtained in the conditions with opposite manipulation where caffeine was used to enhance arousal. Examples of brain MRIs of individual subjects with targets for TMS in occipital cortex In the context of forensic psychophysiology and neuroscience we use EEG and TMS in the experiments on detecting deception (based on varying ERP waveforms and time-frequency analysis of EEG recordings). We also begun studying the effects of TMS on subjects’ predisposition to lie or rather be earnest. These studies are part of Mirjam Veermäe’s and Inga Karton’s dissertation. Kairi Reiman’s theoretical topic deals with legal aspects of cognitive privacy, especially in the context of brain imaging enabling infringement of constitutional freedoms. It is supplemented with EEG/TMS experiments to show that and how “reading the mind” can be made real. Contemporary research on consciousness and NCC considerably owes to the various intriguing phenomena were consciousness appears as a variable in invariant physical conditions of stimulation or where conscious percepts of the stimuli represent objective characteristics and attributes of stimulation not veridically, as it happens in illusions. It is therefore useful to systematize these effects. Up to 2007 there were no publications that would have filled this gap in specialist literature or teaching sources. Together with his American colleagues Bruno Breitmeyer and Haluk Öğmen, Talis Bachmann published a first dictionary of this kind with the US branch of OUP: It is indeed a result of some taxonomic research of phenomena common in the areas of consciousness studies and research on sensation, perception and attention. One such phenomenon, discussed also above in II, is the flash-lag effect. Research devoted to this paradigm continues also during the present period of the activities of our lab. The ways to explain flash-lag based on the developed perceptual retouch theory are introduced by Bachmann (2010a) in a CUP book edited by Romi Nijhawan and Beena Khurana. We have also completed a flash-lag study where we presented data that is inconsistent both with extrapolation theories of the effect and post-diction theories, but supports the retouch theory (published in Bachmann, Murd and Põder, 2012). Other phenomena dealt with in the submitted papers and papers in revision are: adverse effects of visual search on duration of color afterimages, extending the growing body of evidence for the view that attention and conscious awareness mechanisms are not the same (Murd & Bachmann); the effects of uninformative distractors on object location search (published in Bachmann, Põder, & Murd, 2011); neural (EEG-) correlates of afterimages (Einberg, Bachmann, and Murd); EEG-correlates of TOJ (Kujanpää and Bachmann), and a few more. And of course there are discussions about the methodological pitfalls of NCC research on masking based on ERPs (Bachmann, 2009b) and methodological advances in metacontrast research (Bachmann, 2010b). The review of our research would be definitely incomplete without reference to Endel Põder’s more recent studies on crowding and studies by Carolina Murd on motion perception (carried out in Jüri Allik and Kairi Kreegipuu lab as inter-lab research cooperation). Endel showed that whether feature detection and coarse discrimination are immune to crowding depends on other stimulation attributes such as number of flankers (Põder, 2008a). He also shows how visual complexity may be involved in crowding effects (Põder, 2008b). A couple of his other results are also in the pre-publication stage. Carolina demonstrated that although the time needed to detect changes in the colouration of a single moving stimulus decreases with stimulus velocity (Kreegipuu, Murd, & Allik, 2006), the same does not hold for moving gratings (Murd, Kreegipuu, & Allik, 2009). From 2010 onwards, the following main research accomplishments and results have been done and obtained. The experiments on the flash-lag effect (FLE) are now published with Psychological Research. Talis, Carolina and Endel included additional experimental controls to show that a stimulus that is moving towards the moving reference stimulus before the target flash does not di minish the magnitude of the FLE, but augments the effect (Bachmann, Murd, & Põder, 2012). 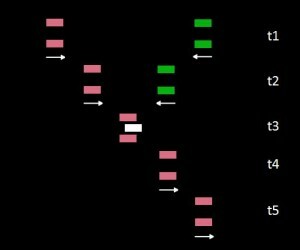 (The illustration here shows stimulation setup for different time moments; pink objects are reference stimulus, white bar is the flashed target; the arrangement of stimuli at time t3 where flash precedes the reference – i.e., a slight flash-lead — is mostly perceived as flash lag.) Extrapolation and post-diction theories are not consistent with the effect, but the perceptual retouch theory and to some extent also theories of updating, attentional capture and positional sampling/averaging appear as consistent with the results. Continuing research on state effects on TMS-evoked brain potentials, Mihkel, Jaan and Talis showed that occipitally evoked task-free brain potentials had increased negativity in NREM sleep compared to the conscious state (Stamm, Aru, & Bachmann, 2011). Interestingly, the effect was well expressed especially when measured by the right-hemisphere frontal and parietal electrodes. This result indicating that (slow) negativity of ERPs could be a signature of consciousness is consistent with views of several other researchers (e.g., He and Raichle) and may be a step towards development of EEG/TMS based technologies of state monitoring in anesthesia and clinical neurology. Teaming up with Renate Rutiku, a follow-up study realized the idea of Talis to TMS-stimulate cortex with double pulses having an unusually long SOA like that in modal masking studies and to contrast conscious and unconscious states for this. It turned out that with 100 ms SOA the second pulse in NREM sleep produced a large-amplitude slow TEP wave while in wakeful conscious state the TEP response to the second pulse was totally suppressed (Stamm et al., 2015). Metacontrast masking continues to fascinate psychophysicists, cognitive scientists and consciousness reseachers; our lab belongs continually to this camp. Our recent paper shows that whether a subject adheres to type-A masking group (monotonic increase in correct perception with increasing SOA) or type-B group (nonmonotonic masking functions) may depend on whether target and mask shapes lead to a perceived dynamic interaction or not (Maksimov, Murd, & Bachmann, 2011). This in turn depended on whether target and mask shapes were congruent or incongruent. Dynamic target-mask interaction may take the form of rotational motion for example. (Some years ago the now Nobel laureate Dan Kahneman has also discussed possible relation of metacontrast subtypes to apparent motion.) In another paper Norman Ojasoo, Mari Aru, Carolina Murd and Talis Bachmann found that caffeine treatment (vs placebo) selectively facilitated dynamic interaction with incongruent target/mask shapes and longer-than-short, intermediate SOAs (Ojasoo et al., 2013). Boosting non-specific arousal system seems to facilitate dynamic interactions in masking, but not necessarily the overall performance level. Thus, the issue of individual phenotypes of masking (e.g., Bachmann, 2010) is still open and hot. We also found that masked priming by a face different from target in general does not have an effect on face-based personality trait perception. However, with few traits such as perceived honesty and benevolence the individual-face-invariant carryover of trait perceptual cues can be found. This work was done by Raina Eluri, Merle Nurmoja and Talis Bachmann. Toomas Kirt uses BRIAN modeling environment for building up a conceptual neuronal network capable of simulating how brain binds together different features of stimuli by synchronizing spiking oscillations. In his model, motivated by the perceptual retouch theory (Bachmann, 1984, 1994) there is a non-specific modulator connected to specific representational neurons and feature-wise specialized modules. Part of this work is introduced in Kirt and Bachmann (2011, 2013). In that latter work Toomas and Talis demonstrated the capacity of the model to simulate several phenomena of conscious vision such as masking, PLP and feature misbinding. Inga and Talis have used rTMS of 1 Hz for influencing left- and right-hemisphere DLPFC in an experiment where subjects were free either to report the identity of a visual stimulus correctly or lie about its feature (Karton & Bachmann, 2011). They found that preliminary right-DLPFC stimulation decreased the relative share of the deceitful responses while left-DLPFC stimulati on relatively increased “lying”. (This research has been recently commented in New Scientist and in a German subsidiary journal of Scientific American.) Subsequent publications showed opposite effects when facilitatory TMS was used instead of the disrupting TMS regime and a leading role of the right-hemisphere DLPFC compared to left-hemisphere DLPFC in lying behavior (Karton, Rinne & Bachmann, 2014). 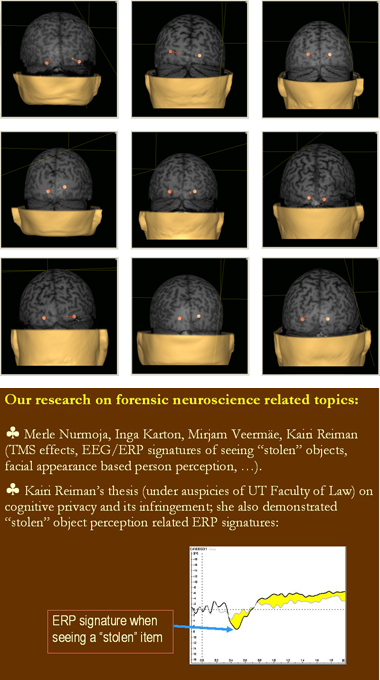 In pending publications Inga, Talis, Anni-Bessie Kitt, Renate Rutiku and others show that TMS has an effect on deception related ERPs (particularly, P300) and that concealed information test type of tasks using pictures of critical items are to be preferred in psychophysiology of deception detection. In collaboration with Jaanus Harro’s research group (University of Tartu, Institute of Psychology) Maive Otsa, Jaanus Harro, Marika Paaver and Talis Bachmann studied how biomarker platelet monoamine oxidase (MAO) activity could be related to risk taking as modelled by a game of skill. In this particular game (Minimum-TBÓ, patented in Estonian Patent Office; registered with European Patent Office as Publication WO2004071596 (A1)), in order to obtain a really high score players have to take some risk. It is also known that individuals with propensity to risky behaviour tend to have low level platelet MAO activity. As expected, there was a correlation between game score and platelet MAO. Players with highest MAO level scored the least. Because measuring risk proneness in a population is usually done „theoretically” by questionnaires, and because risky behaviour with really disadvantageous or hazardous results cannot be used for research purposes this approach is recommendable: a real well measurable physical behaviour is used, but the risk is „symbolic” and thus research ethics can not be compromised. An interesting development in our collaboration concerns the common genetic variability effects on visual metacontrast masking (e.g., Maksimov et al., 2013). Under supervision of Talis and Jaanus and in collaboration with Mariliis Vaht, Margus Maksimov’s studies showed that BDNF Val66Met, NRG1/rs6994992, and 5-HTTLPR variants interact with gender and target/mask shape congruency in determining how metacontrast masking is expressed. This research is continued presently with candidate genes related to dopaminergic and serotonergic brain systems. Two important implications of these studies are that (i) simple psychophysical tests could be developed into screening methods for possible genetic vulnerability risks and (ii) any masking study purporting to find some general regularities of masking functions (and theories of masking based on masking functions) should use large samples of subjects in order to avoid idiosynchratic, ungeneralizable results. Masking studies have continued recently, with the following results being the most interesting. Margus Maksimov, Carolina Murd, Norman Ojasoo, Talis Bachmann and colleagues have found that there are individual differences in masking functions depending on target/mask shape congruence, on criterion contents used by subjects in discriminating targets and that caffeine has an effect on masking at the ascending branch of the masking function especially when target and mask create dynamic interactions (Maksimov, Murd, & Bachmann, 2011; Ojasoo, Murd, Aru, & Bachmann, 2013). Endel Põder has published an influential paper showing that in object substitution masking the reentrant processing model by Di Lollo and colleagues may be substituted by a feedforward attentional model that fits data better (Põder, 2013). Talis also teamed up with a good colleague from Purdue University, Greg Francis, to publish a book on visual masking (Bachmann & Francis, 2013). Jointly with their German colleagues Lucia Melloni and Wolf Singer, Jaan Aru and Talis Bachmann have developed a novel account of how to distinguish between true NCC and the neural signatures appearing in experiments using contrastive research strategy, but not actually the correlates of consciousness. Originally, these ideas were publicised in 2009 and 2010 in several separate publications of the authors and presented by Talis in an oral presentation at the 2009 meeting of the ASSC in Berlin. The collective effort culminated in a highly citable paper in Neuroscience and Biobehavioral Reviews (Aru et al., 2012). To continue the debate on the NCC, Jaan and Talis launched a Research Topic in Frontiers in Psychology (Consciousness Research) in 2014, with prominent contributors such as Biyu He, Anthony Hudetz, Bernard Baars, Nikos Logothetis, Michael Pitts, Steven Hillyard, Quian Quiroga, Morten Overgaard and many others submitting their papers. Talis also published several articles on the relation between attention and consciousness (one paper together with Jaan), content vs level aspects of consciousness, post-diction vs prediction accounts of spatiotemporal visual phenomena, on the all-or-none nature of emergence of conscious contents, and on the possibility that the much celebrated reentrant theory of perceptual processing may be alternatively reinterpreted as an expression of nonspecific top-down modulation (Bachmann, 2011, 2012, 2013a,b, 2014; Aru & Bachmann, 2013). In collaboration with Japan colleague Kuiyasu Imanaka, Renate Rutiku, Anu Einberg and Talis Bachmann studied how task-irrelevant visual backgrounds affect human cortical alpha activity and TEPs (Rutiku, Einberg, Imanaka, ja Bachmann, 2013). Aru, J., Bachmann, T. (2009). Boosting up gamma-band oscillations leaves target-stimulus in masking out of awareness: explaining an apparent paradox. Neuroscience Letters, 450(3), 351-355. Aru, J., & Bachmann, T. (2009b). Occipital EEG correlates of conscious awareness when subjective target shine-through and effective visual masking are compared: Bifocal early increase in gamma power and speed-up of P1. Brain Research, 1271, 60 – 73. Aru, J., Korjus, K., Murd, C., & Bachmann, T. (2012). Spectral signatures of the effects of caffeine and occipitally applied transcranial magnetic stimulation in a task-free experimental setup. Journal of Caffeine Research, 2(1) 23-30. doi:10.1089/jcr.2011.0028. Bachmann, T. (1984). The process of perceptual retouch: nonspecific afferent activation dynamics in explaining visual masking. Perception and Psychophysics, 35(1), 69-84. Bachmann, T. (1987). Different trends in perceptual pattern microgenesis as a function of the spatial range of local brightness averaging. Towards an empirical method for the differentiation between global and local levels of form as related to processing in real time. Psychological Research, 49(2/3), 107-111. Bachmann, T. (1988). Time course of the subjective contrast enhancement for a second stimulus in successively paired above-threshold transient forms: Perceptual retouch instead of forward masking. Vision Research, 28(11), 1255-1261. Bachmann, T. (1989). Microgenesis as traced by the transient paired forms paradigm. Acta Psychologica, 70(1), 3-17. Bachmann, T. (1991). Identification of spatially quantised tachistoscopic images of faces: How many pixels does it take to carry identity? European Journal of Cognitive Psychology, 3(1), 87-103. Bachmann, T. (1994). Psychophysiology of Visual Masking. The Fine Structure of Conscious Experience. Commack, NY: Nova Science Publishers. Bachmann, T. (1997). Visibility of brief images: The dual-process approach. Consciousness and Cognition, 6(4), 491-518. Bachmann, T. (1999). Twelve spatiotemporal phenomena, and one explanation. In G. Aschersleben, T. Bachmann, & J. Müsseler (Eds. ), Cognitive Contributions to the Perception of Spatial and Temporal Events. (pp. 173-206). Amsterdam: Elsevier / North-Holland. (Advances in Psychology, # 129). Bachmann, T. (2001). Origins of substitution. Trends in Cognitive Sciences, 5(2), 53-54. Bachmann, T. (2005). Object substitution and its relation to other forms of visual masking: reply to James Enns. Vision Research, 45(3), 381-385. Bachmann, T. (2006b). A single metatheoretical framework for a number of conscious-vision phenomena. In Q. Jing, M. Rosenzweig, G. d’Ydewalle, H. Zhang, H.-C. Chen, K. Zhang (Eds. ), Progress in psychological science around the world: Proceedings of the 28th International Congress of Psychology. Vol. 1. (Chapter 14.) (pp. 229-242)New York / Hove: Psychology Press (Taylor & Francis). Bachmann, T. (2006c). Imagination as virtual reality and how it can be explained by the perceptual retouch theory of non-specific modulation. Anthropology and Philosophy. International Multidisciplinary Journal, 7(1-2), 10-27. Bachmann, T. (2007a). When beauty breaks down: Investigation of the effect of spatial quantisation on aesthetic evaluation of facial images. Perception, 36(6), 840-849. Bachmann, T. (2007b). Binding binding: Departure points for a different version of the perceptual retouch theory. Advances in Cognitive Psychology, 3(1-2), 41-55. Bachmann, T. (2009a). Metacontrast masking of target-area internal contours and target overall surface brightness: the case of mutually coherent and incoherent visual objects. Spatial Vision, 22(2), 127-146. Bachmann, T. (2009b). Finding ERP-signatures of target awareness: Puzzle persists because of experimental co-variation of the objective and subjective variables. Consciousness and Cognition, 18(3), 804-808. Bachmann, T. (2010a). Priming and retouch in flash-lag and other phenomena of the streaming perceptual input. Chapter 30, (536-557.) In R. Nijhawan, B. Khurana (Eds. ), Space and Time in Perception and Action. Cambridge: Cambridge University Press. Bachmann, T., & Allik, J. (1976). Integration and interruption in the masking of form by form. Perception, 5, 79-97. Bachmann, T., Breitmeyer, B.G., & Öğmen, H. (2007). The experimental phenomena of consciousness: A brief dictionary. New York: Oxford University Press. Bachmann, T., Breitmeyer, B.G., & Öğmen, H. (2011). The experimental phenomena of consciousness: A brief dictionary revised edition. New York: Oxford University Press. Bachmann, T., & Hommuk, K. (2005). How backward masking becomes attentional blink. Perception of successive in-stream targets. Psychological Science, 16(9), 740-742. Bachmann, T., & Kahusk, N. (1997). The effects of coarseness of quantisation, exposure duration, and selective spatial attention on the perception of spatially quantised (“blocked”) visual images. Perception, 26(9), 1181-1196. Bachmann, T., & Leigh-Pemberton, L. (2002). Binocular rivalry as a function of spatial quantisation of the images of faces: precategorical level controls it. Trames, 6(4), 283-296. Bachmann, T., Luiga, I., & Põder, E. (2004). Forward masking of faces by spatially quantised random and structured masks: On the roles of wholistic configuration, local features and spatial-frequency spectra in perceptual identification. Psychological Research/ Psychologische Forschung, 69(1-2), 11-21. Bachmann, T, Luiga, I, & Põder, E. (2005a). Variations in backward masking with different masking stimuli: I. Local interaction versus attentional switch. Perception, 34(2), 131-137. Bachmann, T., Luiga, I, & Põder, E. (2005b). Variations in backward masking with different masking stimuli: II. The effects of spatially quantised masks in the light of local contour interaction, interchannel inhibition, perceptual retouch, and substitution theories. Perception, 34(2), 139-154. Bachmann, T., Luiga, I., Põder, E., & Kalev, K. (2003). Perceptual acceleration of objects in stream: evidence from flash-lag displays. Consciousness and Cognition, 12(2), 279-297. Bachmann, T., & Murd, C. (2010). Covert spatial attention in search for the location of a color-afterimage patch speeds up its decay from awareness: Introducing a method useful for the study of neural correlates of visual awareness. Vision Research, 50(11), 1048-1053. Bachmann, T., & Nurmoja, M. (2006). Are there affordances of suggestibility in facial appearance? Journal of Nonverbal Behavior, 30(2), 87-92. Bachmann, T., & Põder, E. (2001). Change in feature space is not necessary for the flash-lag effect. Vision Research, 41(9), 1103-1106. Bachmann, T., Põder, E., & Luiga, I. (2004). Illusory reversal of temporal order: the bias to report a dimmer stimulus as the first. Vision Research, 44(3), 241-246. Bachmann, T., & Sikka, P. (2005). Perception of successive targets presented in invariant- item streams. Acta Psychologica, 120(1), 19-34. Crick, F. & Koch, C. (2003). A framework for consciousness. Nature Neuroscience, 6(2), 119-126. Crick, F.C. & Koch, C. (2005). What is the function of the claustrum? Philosophical Transactions of the Royal Society B: Biological Sciences, 360(1458), 1271-1279. Harmon, L.D., & Julesz, B. (1973). Masking in visual recognition: Effects of two-dimensional filtered noise. Science, 180(4091), 1194-1197. Herzog, M.H., Fahle, M., & Koch, C. (2001). Spatial aspects of object formation revealed by a new illusion, shine-through. Vision Research, 41, 2325-2335. Hommuk, K., Bachmann, T., Huckauf, A., Luiga, I., & Murd, C. (2007). In-stream temporal facilitation of test-stimulus perception with repetitive TMS to visual cortex: attentional effects are enhanced. Perception, 36, Supplement, 8-8. Hommuk, K., & Bachmann, T. (2009). Temporal limitations in the effective binding of attended target attributes in the mutual masking of visual objects. Journal of Experimental Psychology: Human Perception and Performance, 35(3), 648-660. Hommuk, K., Bachmann, T., & Oja, A. (2008). Precuing an isolated stimulus temporarily outweighs in-stream stimulus facilitation. Journal of General Psychology, 135(2), 167-181. Kirt, T., & Bachmann, T. (2011). Binding features by relaying modulator group of neurons. BMC Neuroscience 2011, 12(Suppl 1):P7. Kirt, T., & Bachmann, T. (2013). Perceptual retouch theory derived modeling of interactions in the processing of successive visual objects for consciousness: Two-stage synchronization of neuronal oscillators. Consciousness and Cognition, 22(1), 330-347. Kreegipuu, K., Murd, C., & Allik, J. (2006). Detection of colour changes in a moving object. Vision Research, 46, 1848-1855. Luiga, I., & Bachmann, T. (2007). Different effects of the two types of spatial pre-cueing: what precisely is “attention” in Di Lollo’s and Enns’ substitution masking theory? Psychological Research, 71(6), 634-640. Luiga, I., & Bachmann, T. (2008). Luminance processing in object substitution masking. Vision Research, 48, 937-945. Luiga, I., Gellatly, A., & Bachmann, T. (2010). Delayed offset of distracters masks a local target. Acta Psychologica, 134(3), 344-352. MacDonald, J., Andersen, S., & Bachmann, T. (2000). Hearing by eye: how much spatial degradation can be tolerated? Perception, 29(10), 1155-1168. McGurk H., & MacDonald, J. (1976). Hearing lips and seeing voices. Nature (London), 264, 746-748. Murd, C., Aru, J., Hiio, M., Luiga, I., & Bachmann, T. (2010). Caffeine enhances frontal relative negativity of slow brain potentials in a task-free experimental setup. Brain Research Bulletin, in press. Murd, C., Kreegipuu, K., & Allik, J. (2009). Detection of colour change in moving objects: Temporal order judgment and reaction time analysis. Perception, 38, 1649-1662. Põder, E. (1999). Search for feature and for relative position: measurement of capacity limitations. Vision Research, 39(7), 1321-1327. Põder, E. (2001). Size-based selection in rapid serial visual presentation. Vision Research, 41(17), 2221-2234. Põder, E. (2003). Spatial-frequency spectra of printed characters and human visual perception. Vision Research, 43(14), 1507-1511. Põder, E. (2004). Effects of set-size and lateral masking in visual search. Spatial Vision, 17(2), 257-268. Põder, E. (2005). Efect of attention on the detection and identification of masked spatial patterns. Peception, 34(3), 305-318. Põder, E. (2006). Crowding, feature integration, and two kinds of “attention”. Journal of Vision, 6(2), 163-169. Põder, E. (2007). Effect of colour pop-out on the recognition of letters in crowding conditions. Psychological Research – Psychologische Forschung, 71 (6), 651-645. Põder, E., & Wagemans, J. (2007). Crowding with conjunctions of simple features. Journal of Vision, 7(2):23, 1-12. Põder, E. (2008a). Crowding with detection and coarse discrimination of simple visual features. Journal of Vision, 8(4), 24. Põder, E. (2008b). Crowding and visual complexity. Perception, 37, Supplement: Thirty-first European Conference on Visual Perception; Utrecht, The Netherlands; 24 – 28 August 2008, 121. Põder, E., (2011b). Alternative models of substitution masking. Perception 40 ECVP Abstract Supplement, p. 175.